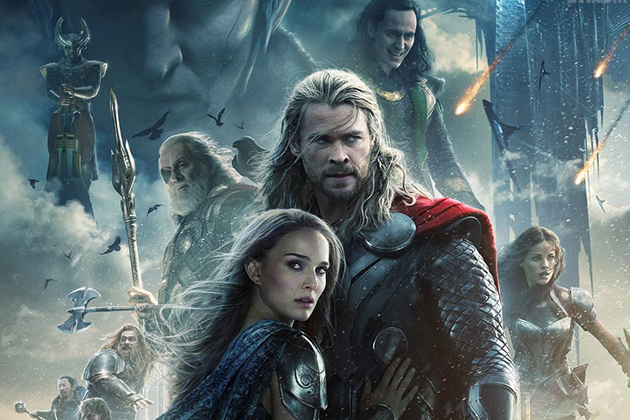 Look, if you haven’t seen Thor: the Dark World yet, you really need to. I mean, if you like superhero movies. I won’t spoil you with any details here- but the gist of my review is that if you like this sort of thing, you should go see it. I happen to love this sort of movie. Since I saw my first one- probably Superman III (which scared the beejesus out of me, btw). But then, I like comics and superheroes… so translating to the big screen just makes them better (OK, not always). In any case, I was pretty excited to go see this one as I’ve been enjoying the Marvel films. One thing I really loved about this film that differed from the previous Thor film was that it was primarily set on Asgard, Thor’s home. While there was plenty of time on Earth or in space or on The Dark World, it was quite pleasant to see more of Asgard and see Thor interacting there. One thing that bothered me- but not that much- was that during one battle scene, I felt like I was watching a Star Wars film. If you’ve seen the film, you know what I’m talking about. From the sounds to the style of fighting and movement, I was waiting for stormtroopers to shoot a hole through a wall and march in. But this may have just been me and crazy sci-fi head. Maybe. I haven’t read any reviews of the film but I did hear or see peripherally that a lot of people had issues with it. I don’t understand that. Did they sit down and have an enjoyably fun ride for 2 hours? Then why are they complaining? Right, I know… they are mega-Thor fans and are nitpicking. Well, to that I say this- “if you don’t like how it’s being done, do it yourself. And if you aren’t going to do it yourself, take a chill pill and enjoy the ride.” Seriously. A superhero movie should be fun, action-packed, with a simple story line (along the lines of “bad thing happens, good guy shows up to help, epic fight between good and evil, good guy wins, girl swoons.” Of course, guy and girl are interchangeable because superheroes are not gender specific). You should be able to sit and have fun for two hours without worrying about your troubles or what you have to do later. Anyways… Tom Hiddleston and Chris Hemsworth have such fun chemistry together. I can see them poking at each other the way brothers do. The longing looks between Jane (Natalie Portman) and Thor (Hemsworth) make you “aww” and also kinda make you want to hurl until, of course, she slaps him for being a guy and not even calling! Which, by the way- hilarious! Someone needs to give Stellan Skarsgard (Dr. Erik Selvig) all the fun awards- his comedic timing is awesome. I could go on and on about the cast and their performances, but what you need to know is that they had fun and it shows. Not saying anything about what they are but be sure to stay through the credits as there are two teasers. The first, mid-credits, sets forth a later film in the series. The second, post-credits, ties things up. Sort of. It still baffles me that people leave as soon as the credits start. For the showing I went to, by the time we got to the second teaser, 85% of the people had left. I get that credits aren’t exactly the most fascinating thing ever if you aren’t in the business (I happen to enjoy hunting for strange jobs or names), but come on… this has been happening for a decade on tons of films- especially ones of this genre- why even bother getting up? Oh well. So there you have it- my rambling thoughts of the latest superhero movie. What is the final takeaway? Go see the movie. And have fun! ← Oh, BBC, why can’t I quit you?!?!??? Sounds good. Kind of liked the first one, so I’ll eventually check it out. Although, i’m more pumped for the next Captain America movie, because it takes some stuff from one of the really good storylines of that comic. Hard to talk about that without getting spoilery. I avoid trailers as much as possible, as well as rumors and what have you- I want to see my trailers on the big screen as a special prize when I actually make it out to see something- so I knew very little about the new Captain America. Random tidbits only; and what James has told me. But they ran the trailer with this film and it looked really good. I can haz noa, yes?